Singapore Freebies: The Manhattan Pizza Co.: All-You-Can-Eat Pizza Buffet @ S$15 only!! 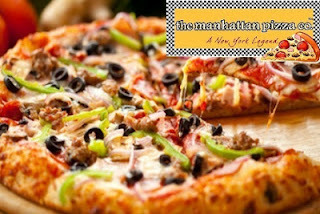 The Manhattan Pizza Co.: All-You-Can-Eat Pizza Buffet @ S$15 only!! For $15, you get an All-You-Can-Eat Classic Pizza Buffet for One Pax (worth $37.60). For $29, you get All-You-Can-Eat Classic Pizza Buffet for Two Pax (worth $75.20). For $57, you get All-You-Can-Eat Classic Pizza Buffet for Four Pax (worth $150.40). For $18, you get All-You-Can-Eat Specialty Pizza Buffet for One Pax (worth $39.60). For $35, you get All-You-Can-Eat Specialty Pizza Buffet for Two Pax (worth $79.20). About The Manhattan Pizza Co.
Take in as much of The Manhattan Pizza Co.'s freshly made, generously topped pizzas as you can, sinking gnashers into fluffy crust that is crispy at the edges and topped with generous amounts of cheese and other toppings. Choose from popular, hearty options such as the Meat Lover, which features four different kinds of meats to tantalize carnivorous appetites, or the Seafood pizza, which brings together a myriad of seafood flavours from fresh catches. Alternatively, order up classics such as the Hawaiian, the Regina, a pizza covered with tomato, mozzarella, mushrooms and ham, or tantalize tastebuds with a Roast Duck pizza, inspired by Singapore's very own coffeeshop staple.